One of the most interesting things about studying abroad so far is the Italian culture. It should be no surprise that it’s different from the States. There’s a change of pace. It is quite challenging to be in a country without knowing the native language. I have picked up some phrases here and there. I might not become an expert, but I’ll be very happy if I at least learn how to order a gelato in Italian! Of course, when coming to a new country, you start to pick up their customs. Stores are not open during the late afternoon because it’s “siesta” time. You might have to wait five or fifteen minutes for the 990 bus. That doesn’t mean that Italy is a terrible place. It’s different. Everyone here is more relaxed, which I enjoy. Dinners last longer. Waiters don’t rush you to finish your meal. You can sit back and chat with your friends. It also gives us extra time to savor the pizza and pasta. You can’t forget about the “study” part of being abroad. The past weekend I was able to take a tour of Pompeii. 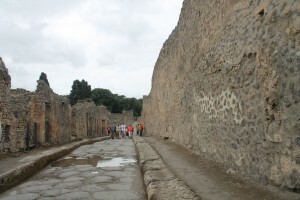 Walking through the ancient ruins made me picture a busy ancient Roman city with forums, theatres, and homes. The group and I even got to eat lunch on Mount Vesuvius! In addition, I had an amazing opportunity with other JFRC students to visit the pope’s summer residency and the Vatican Observatory in Castel Gandolfo. Brother Guy Consolmagno, an American reserach astronomer and planetary scientist, gave us a great tour. 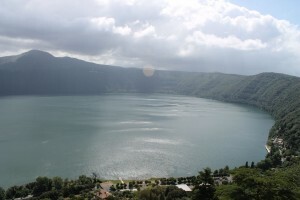 Lake Albano is gorgeous! I have to say that the JFRC has done an incredible job on having students connect in studying abroad. We have dinner outings every week and other fun events. You can feel the sense of community here. This weekend I’ll be hiking in Abruzzo for another study trip so I am excited to see another part of Italy. I’ll write again next Thursday. Ciao!